← Debate Reaction from the Betting Markets: Meh. 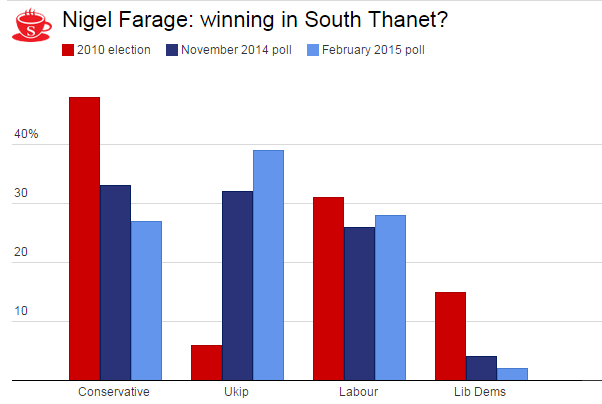 Is Farage in trouble in Thanet South? Over the past couple of weeks, the odds of Nigel Farage winning Thanet South have drifted from 1/3 to today’s 1/2. So, whilst he is still favourite, the betting market is becoming less certain that he’ll win. In particular, that’s been accompanied by an increase in the prospects for a Labour gain, the odds of that falling from 10/1 into 5/1. If you want to check out the odds on any constituency via our new betting election map, head for Ladbrokes new dedicated election minisite. It’s hard to tell yet whether Farage’s performance in the debate will make any difference to his chances. The last poll of the constituency was in February and showed Farage on 39%, with an 11% lead over Labour just in second place.